Dallying In The Dirt, Issue #235--- A good crop of Rutabagas are making a dinner time appearance. Unexpected pleasures continue to make gardening a never ending adventure. 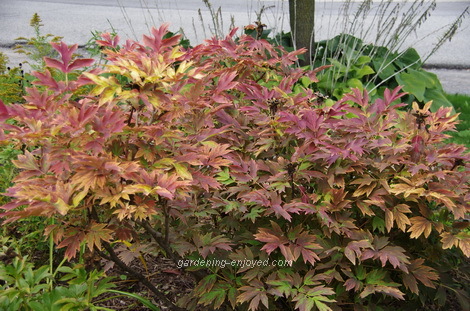 This tree Peony is magnificent in the late spring but now its leaves have developed these amazing colours that make it an outstanding feature in the garden for a second season. Scattered among the leaves are a few large seed pods curled open to reveal some large shiny black seeds. I have resisted the urge to try and germinate these seeds. Peony seeds can often take a couple of years to germinate and I know that I would lose track of them before they ever made an appearance and it’s probably unlikely that they are viable. That’s my rationale for not even trying, despite my horticultural curiosity as to what they might grow into. The weather here in my little corner of the world has taken a rapid drop into fall temperatures making me have to make sudden adjustments in my gardening attire. I wasn’t ready for it and have had some trouble convincing my self to get dressed and head out to undertake the many fall chores awaiting me. It’s also easy to get distracted by the sudden appearance of some magnificent Colchicum blooms. These amazing bulbs pop out of the soil and each year I wonder what wakes them up. They are underground so the day length cannot have too much influence and the fall weather has been very warm until this week, so what wakes them up. Here is another of my dilemmas. The container of Potatoes is ready to harvest. 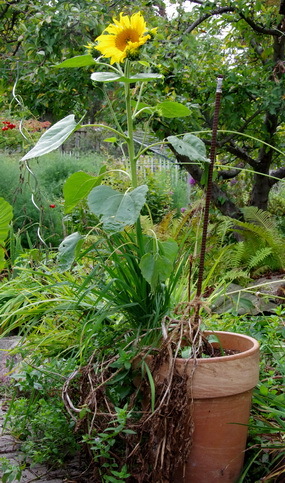 The Potato plants have long since died down and are hanging over the side of the pot but this amazing Sunflower has sprouted up surrounded by a clump of dense grass. I suspect these are items that somehow wandered, by themselves or by squirrel power, from the bird feeder to the Potato pot. I cannot bring my self to destroy that lovely Sunflower and I know the Potatoes will wait patiently for me in their cozy warm soil. By some definitions, I could see this Sunflower as a weed, I didn’t plant it and I really don’t want it in that pot but gardening is about recognizing the beauty that Mother Nature provides in her own time and locations. Rutabagas. You may want to call them Turnips. Turnips, to me, are a small round white vegetable that we harvest in early summer and sometimes a second crop in early fall. 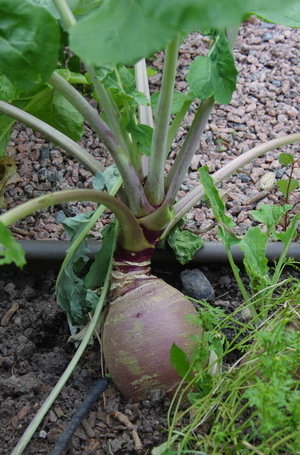 Rutabagas provide those large purple skinned roots that we can keep in our cold cellars for part of the winter. I used to really dislike the bowl of orange mush that was offered at every Thanksgiving dinner, at Grandma’s house. Each year I have been more successful at growing them and this year has seen a rather good crop developing in the these cooling days of autumn. I have learned to cook them. They usually get chopped into large chunks and smeared with a little butter and then wrapped in aluminum foil and tossed onto the barbeque for about 45 minutes. That package often includes some Potatoes and occasionally some Onions as well. Last night there were a few sprigs of Rosemary included. All quite delicious. Having been away from the garden for a little over two weeks, there is a long list of chores awaiting me and the task of deciding where to start is often the biggest job of the day. Planting some of the new bulbs is always a good start and there are some exciting new varieties that will keep us anticipating their blooms through the dark winter months. David Asks? When are you going to take your favourite son-in-law to California? I will even carry your camera equipment! Claire Asks? I’ve heard you mention some Crocus bulbs that seem to be squirrel resistant, what are they. Ken Answers! Crocus thomasinianus seem to be unpalatable to the tree rats and I’m planting two varieties this year, Roseus and Ruby Giant. They are both quite early and are smaller than the later giant types that the squirrels devour.